Internet privacy is a very controversial issue. Is compiling already publically available information considered a violation of one’s rights? I would argue that this is not. However I also would argue that it is rather unnecessary to compile private information on individuals. Lets take a look at the website Spokeo.com. 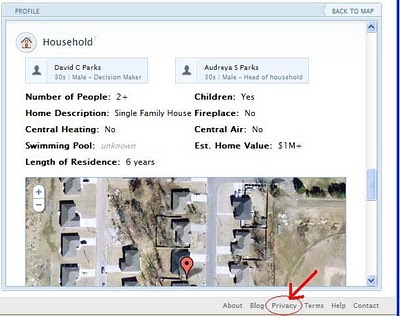 By typing in my uncle’s name I can find out where he lives, a photo of his house, how much his house is worth, his telephone number, his wife’s name, whether they have kids or not and lots of other seemingly personal information. While one must realize that all of this information is public in one way or another, why is it necessary to compile it all into a single website? This allows an individual who simply knows another persons name to obtain information about their home and their family. Consider an extreme example in which a child molester is seeking a future target. A website like Spokeo.com could facilitate the child molester’s search. While the issue is not that of invasion of privacy from a legal standpoint , the issue is why is it necessary to make it so easy for an individual to gain this information by simply searching one’s name. Consider the real life example of the home invasion of the Petit Family in Cheshire, CT. In this particular case the individuals responsible were looking for money. The two assailants had kidnapped the Petit family and forced Mrs. Petit to go to the bank and withdraw money from her bank account. In addition the two assailants raped Mrs. Petit and her daughter. A website like Spokeo.com could facilitate the horrible acts committed by these individuals by making it easier to obtain information. An individual could identify someone within the community such as Dr. William Petit and suspect that he was wealthy. Logging on to Spokeo.com would be able to confirm such a suspicion as information about one’s wealth is displayed. Also an interactive picture of the house from Google Maps is provided that would allow an individual to plan a home invasion from the comfort of their home. Scalia brings light to this point that despite being legal, it is unnecessary to provide a database that reveals private information. Scalia said, “It is not a rare phenomenon that what is legal may also be quite irresponsible.” Perhaps the concept of an individual’s privacy on the Internet should be considered from the perspective of the moral responsibility to protect an individual rather than the viewpoint of legality. In tern we as users of the Internet must have an obligation to protecting ourselves to the best of our abilities. Choosing to use social networking sites such as Facebook makes it rather easy to gain information about an individual if proper steps aren’t taken to make this information private. A website like Spokeo.com uses information that is publically available from websites such as Facebook to build an individuals Spokeo profile. As a user of the Internet it is important to read the privacy policies of the websites being used to understand if and how your individual information is protected. The Internet has made our lives easier in many ways and more difficult in others. Internet security is one of the main problems with the Internet since its birth. Although websites take precautionary steps to protect our information it is important to also protect ourselves and not offer private information over the internet. To a large degree, I agree with your claim that it is the responsibility of the individual to protect their information online, and I think that certain traditional American views support this opinion. These views include how we Americans traditionally place a large degree of emphasis on people’s responsibility for their own actions, and how our justice system holds that ignorance is not grounds for acquittal. But I think that the reason that so many Internet users do post their information online has to do with the fact that the Internet makes it so easy to do so, especially in the era of broadband. It almost seems as if a quick, easy to use Internet may be to some extent dangerous because it enables users to spread valuable personal information without thinking twice.